Southern California is home to a variety of ant populations that infest local homes and business all year. Before treating an ant infestation, it is important for a state licensed technician to identify the type of ant and the source of the infestation. Once the problem has been identified, a customized plan of action can begin. Argentine ants or black ants, are the most common type of ants found in the home. Originally from Argentina, these ants hitched a ride in shipping containers sometime during the early 20th century. Black ants do not attack or compete with each other, which has helped their prolific spread throughout the country. Black ant infestations, like most standard pests, are typically influenced by our local weather patterns. These ants are highly likely to move indoors in search of food, water and shelter during hot and dry spells, the rainy season, or unseasonably cold weather. While they are not poisonous to humans, they can easily take over a kitchen or bathroom in a matter of hours. These ants are also responsible for protecting agricultural pests like aphids, from predators and parasites. Gardens can easily become overrun and it is important to eliminate black ant infestations outside as soon as they are detected. The treatment of black ants begins with a state licensed technician coming to your home or business to inspect the source of the problem. Once the pest species and source have been determined, the technician will customize a treatment plan using only low-toxicity, low to no odor pesticides to treat the interior and exterior of your home or business. Since black ants are known to return when the weather shifts, we recommend beginning a regular pest maintenance program to keep ants away all year long. Click here to learn more about our standard pest control service. 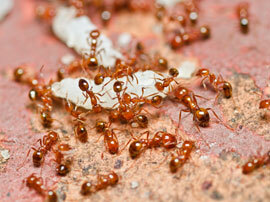 In recent years, Red Imported fire ants or fire ants, as they are commonly known, have started migrating west. Fire ants typically live in desert areas, but with warmer, dryer weather in southern California, they have started infiltrating populated areas. These ants are slightly larger than Argentine ants and they are reddish orange in color. Fire ants build their nests in sandy mounds outdoors or near structural foundations. Fire ants become aggressive when they are threatened. Although a single sting is quite unpleasant, fire ants are not typically dangerous. Multiple fire ant stings can cause anaphylactic shock and they are dangerous to pets, small children and the elderly, or anyone with a weakened immune system. 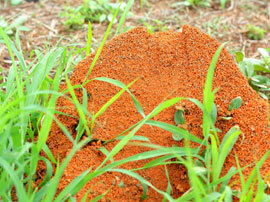 Finding fire ant mounds on your property? Pest Innovations uses low toxicity, low or no-smell pesticides to treat fire ant infestations. Depending on the location of the infestation, a Pest Innovations technician will determine where to treat and will often times recommend a full exterior treatment. The technician may also use granules or a gel bait if these ants are coming from cracks and crevices. When you call Pest Innovations to treat your ant infestation, we will send a state licensed technician to your home or office to determine the scope of the infestation. After a thorough walk-through of your property, the technician will recommend a customized treatment plan for you. We use low toxicity, low or no-odor pesticides, gel bait or granules, along with targeted treatment. You will not need to worry about relocating for the day, as our treatments can be done while you are home. 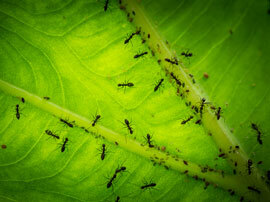 Pest Innovations recommends beginning a regular maintenance program to keep ants away. Because ant infestations can be caused by severe weather changes, a one-time treatment may not be enough to keep them out of your home all year. We offer monthly, bi-monthly and quarterly service. For more information about our services, call Pest Innovations today! Thank you very much for helping resolve my ant issue. It's been a nightmare until I hired you guys. Regular ant control service prevents future outbreaks. Pest Innovations is happy to customize a regularly scheduled ant control service based on your needs and budget. We offer monthly, bi-weekly and weekly service. We also offer bi-monthly and quarterly service. If you’re interested in our ant pest control services, call Pest Innovations today! Termidor spreads through the colony like a virus. We have several ant pest control treatment options available to you depending on your needs, severity and location of the pest infestation. Gel Baits: Gel ant bait products provide great secondary knock down of ants after the initial treatment or in areas that are highly sensitive to pesticide. Gel baits contain active ingrdients like fipronil which work slowly, typically over a couple weeks. Ants bring the bait back to the colony where they transfer the bait to the queen and other members of the colony. Gel baits work great in tight spaces like kitchens and bathrooms where they are protected from the weather. Dusts: Completely odorless and non-staining, dusts are a long term residual pesticide product that kills ants through contact. Dusts are best suited to crack and crevice use where ants enter the structure. Some dusts can treat and provide residual protection for up to 8 months when left undisturbed. Granules: An increasingly popular method of applying repellent pesticides, granules are broadcast around the exterior of the property, laying down a protective barrier that stops ants from entering the structure. Low & No Odor Repellent Sprays: Low odor / no odor repellent ant sprays are a common solution for eliminating ants from a property. Chemicals are diluted in water and broadcast sprayed over a property, killing ants on contact and deterring future ants from entering the property for up to 2 months. Broadcast spraying also exterminates other exterior pests, such as spiders, fleas, cockroaches, etc. Non-Repellent Sprays: Products like Termidor are not detectable to ants and allow the ants to continue to forage undisturbed. After the ants contact non-repellent pesticides, the ants return to their nest. Ants communicate by contact, spreading the treatment and infecting other ants, killing the colony.